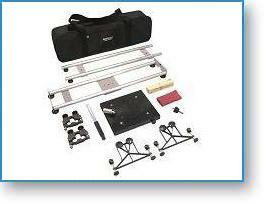 The MICRODOLLY SuperSlider™ Kit is the perfect tool to accomplish tracking shots. 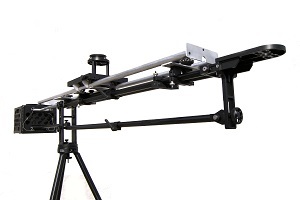 This innovative Slider can be quickly mounted onto any length MICRODOLLY Jib in less than sixty seconds. Both the Jib and SuperSlider™ remain completely functional at all times. 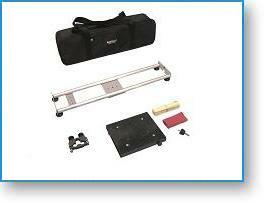 The SuperSlider™ may also be used directly on the ground with its four point adjustable leveling feet. Another option is to mount the track to one or more tripods. 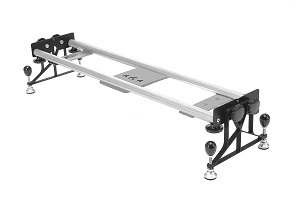 One major improvement over other slider dollies is that the MICRODOLLY SuperSlider™ travels on smooth and silent weatherproof custom made wheels. The track is manufactured of sturdy structural-grade anodized aluminum and may be extended in 32" (23 cm) increments to as long as you wish. In summary, the SuperSlider™ Kit brings a whole new dimension to contemporary camera support and is particularly well suited for HDSLR cameras. 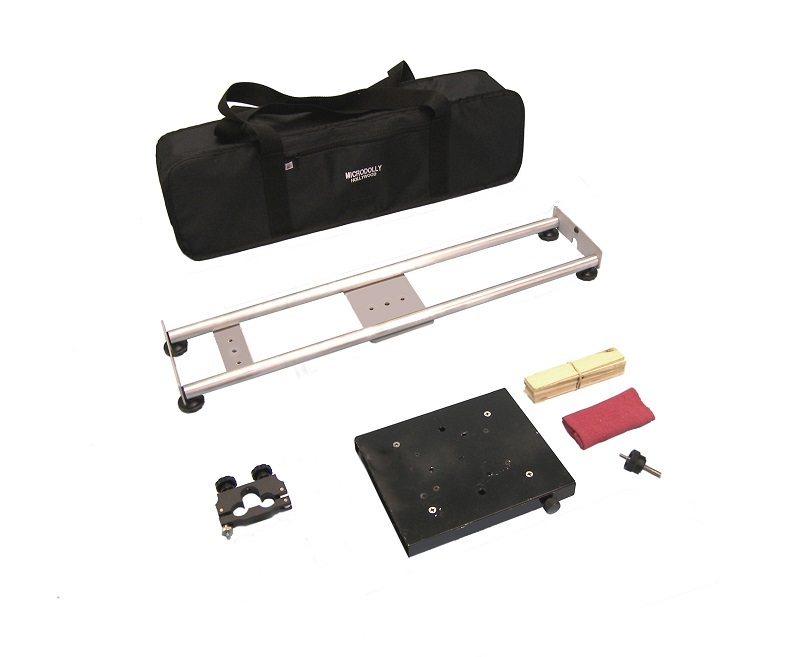 The MICRODOLLY SuperSlider™ Basic Kit includes the 32" starter track, two end plates and one center plate, 8 wheel camera dolly with adjustable drag break, one track clamp to mount to the MICRODOLLY Jib, reversible Camera Knob (1/4" & 3/8"), a set of 12 wood leveling shims, cleaning cloth and a laminated 3D card set up instructions. Everything is securely packaged in a Soft Case made with a tough ballistic nylon outer shell and lined with PVC for weather protection. 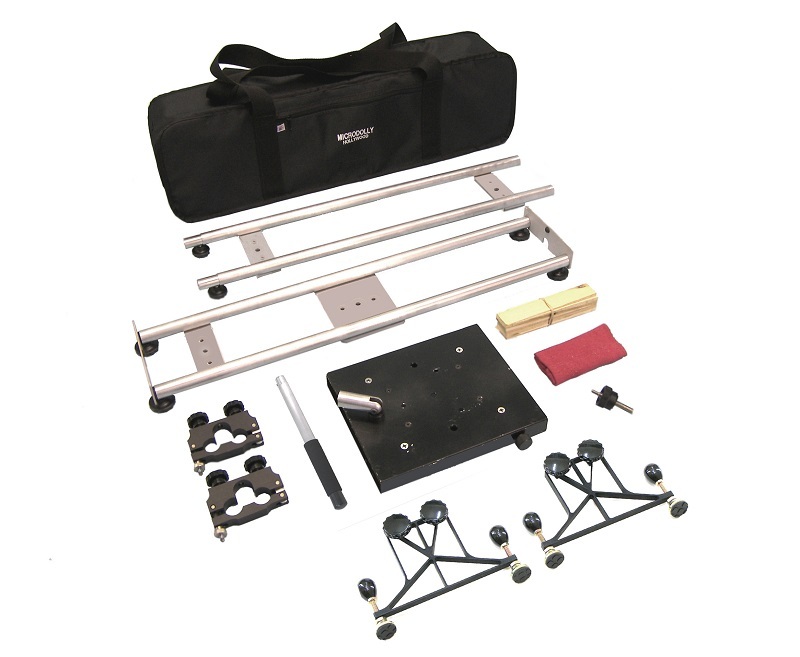 The Pro Kit includes the 32" starter track plus a 32" extension rail set, two end plates and one center plate, 8 wheel camera dolly with adjustable drag break, two track clamps to mount to the MICRODOLLY Jib, four adjustable end legs, SuperSlider™ Push Handle and mounting bracket, reversible Camera Knob (1/4" & 3/8"), a set of 12 wood leveling shims, cleaning cloth and a laminated 3D card set up instructions. Everything is securely packaged in a Soft Case made with a tough ballistic nylon outer shell and lined with PVC for weather protection.